These “Man pages” are used to describe commands, show their features, and give options on how to use them. To view a man page for a command, issue the command “man command“. 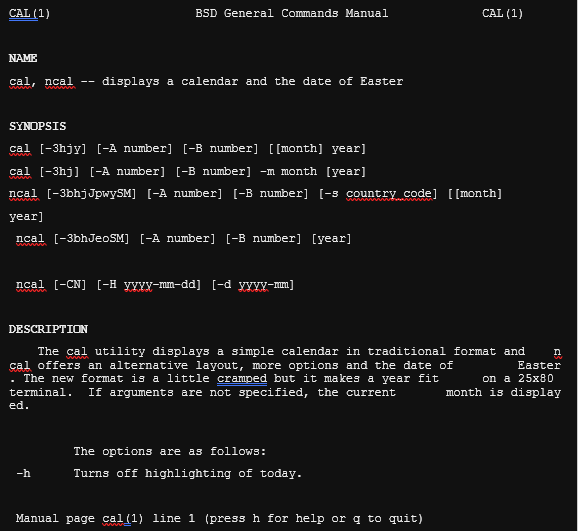 man cal will display the man page for the cal command, or the calendar command. The following is an example of a man page. To move around a man page we use keyboard keys. Return goes down a line, space goes down a page, /term can be used to search for a term/word, n is used to go to the next item matching the search, 1G goes to the beginning of the page, G goes to the end, h displays a help page, q quits the man page. There are also sections of a man page. The NAME section gives a description and the name of the command. The SYNOPSIS section gives ways of how to use the command and how it is executed. The DESCRIPTION section gives a more in-depth description than that of the NAME section. The OPTIONS section shows the different options for using the command and info about how they are used, however, this section is usually in the DESCRIPTION section and not its own. The FILES section shows the files that are linked to the command and how to use them. The AUTHOR section shows the name and contact info of the person that created the man page. There is also sometimes a REPORTING BUGS section to report any problems with the page. The COPYRIGHT section shows the copyright information. And finally, the SEE ALSO section gives ways of finding more info about the command and most often different commands that are like the one the man page is for. This is the essential information needed to navigate a man page, how to tell apart the information, and what man pages are.